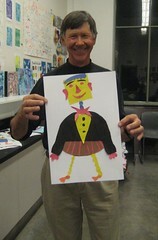 I'm teaching kids classes at the San Diego Museum of Art starting in January. 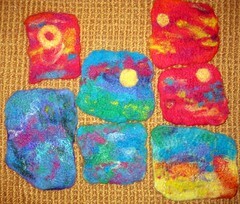 Each week kids will get creative with a different material and theme. This class will provide a venue for each young artist to be creative with gentle guidance in drawing, painting and sculpture. Creative problem solving and laughter is encouraged while discovering the joy of making art! Husb serves crab legs, and I will stuff the mushrooms for tomorrow. The tangerine is for a snack. Merry Christmas everyone! It was my turn to do the illustration and husb's turn to write the holiday letter. The cards will be in the mail tomorrow! Even BeBop is making a list and checking it twice. Andrea's birthday party dinner--where the debut of my Chicken Verde Enchiladas were enjoyed by all. Cook, draw, cook, draw, paint, cook. This was a very quick sketch as I prepared enchiladas for the first time--for a birthday dinner party for 10! Thanks to Denise, who suggested the recipe--I'm pretty sure it was a success. I'm home! Husb and I spent four days in San Francisco visiting family and friends. Note the It's It in my moleskine. It's two oatmeal cookies with vanilla ice cream in-between and coated in dark chocolate. I had to draw it very quickly because it was melting and it was soooooooo good. We bought a case, and brought them home packed in dry ice. 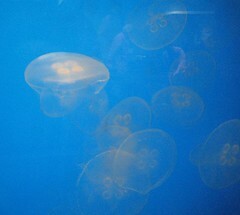 We visited the brand new Academy of Sciences in Golden Gate park. It's incredible! 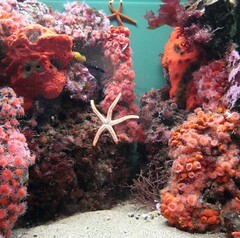 An aquarium, planetarium and a four story rain forest all in an light filled 'green' building. You gotta go see it. It's right across from the gorgeous deYoung Museum, another must see. 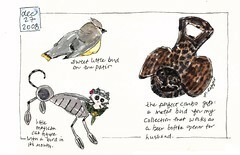 I taught my 'Sketching & Watercolor: Journal Style' at the California Center for Creative Renewal on Saturday, Dec 6. This is the fourth time I've taught there, and you can see why! It's the perfect location for my class. We had 21 people and everyone enjoyed themselves. The weather was perfect, like 77 degrees. I'll be teaching there again next year, in probably August and December. NEXT workshop at CCCR is Saturday, August 15., 2009. 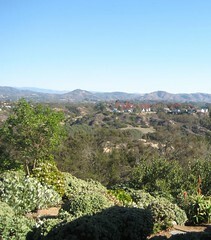 "on a clear day, you can see forever...." The view from California Center for Creative Renewal in December! Here is yet another reason why I love my husband! I was too sick yesterday to teach Mundo Lindo, so Don filled in with my assistant Lizzie. Here he is with the robot he created in class. 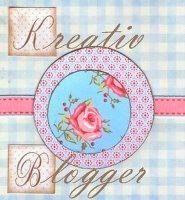 Thanks Lynn Majidimehr for awarding me this Kreativ Blogger award. It's so nice to be noticed in the big blog world. If I've left a comment on your blog, consider yourself nominated. 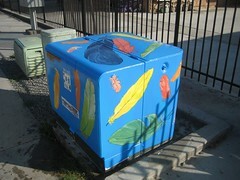 Utility Box news: Here's a link to a story in today's San Diego Union Tribune about the project. 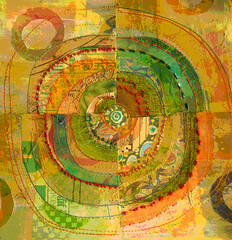 Art UnRaveled 2009: I'm honored to be teaching there again this coming August in Phoenix. The schedule will go up in January, but I'll be teaching all day August 5: Paper on Cloth Collage. 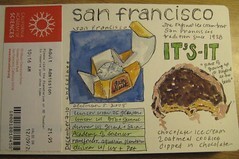 All day August 6: Sketching & Watercolor-Journal Style. 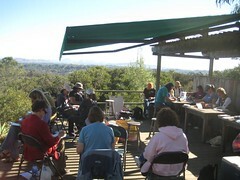 From 7am-10am, August 7 on location Sketching & Watercolor-Journal Style. 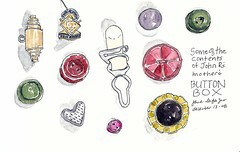 Lastly, don't forget to put my 2010 Bella Italia: Orvieto Sketchbook trip on your wish list. Stop the presses. 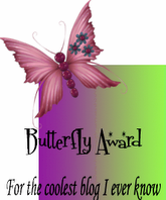 dear Sandy just awarded me a blog award too! Sandy was in my workshop in New York and is a lovely person and wonderful journal artist. Thanks Sandy!! here's my completed utility box. 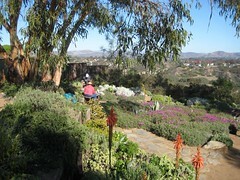 it's located on Imperial Ave and 55th in Southeast San Diego.